A is for Amélie. Le Fabuleux Destin d’Amélie Poulain (The Fabulous Destiny of Amélie Poulain), or simply Amélie, is a 2001 romantic comedy film, starring Audrey Tautou. This is one of my favourite French films and has won many awards including two BAFTAs. In this idiosyncratic film, Amélie, a young woman who grew up isolated from other children, is a waitress in The Café des 2 Moulins (The Two Windmills) in Montmartre. Amélie decides to devote her life to bringing happiness to others. The people who work in and frequent the café are as wide a variety of eccentrics as you could hope to meet anywhere. Since the release of the film in 2001, the café has become something of a tourist destination, yet, when we went to visit, we had no difficulty finding a table and the service was prompt, friendly and welcoming. The 1950s décor has been preserved throughout and memorabilia of the film is displayed in the café, including a gnome on the bar who surveys the customers. What better place to start your day with a coffee before exploring the delights that Montmartre has to offer? 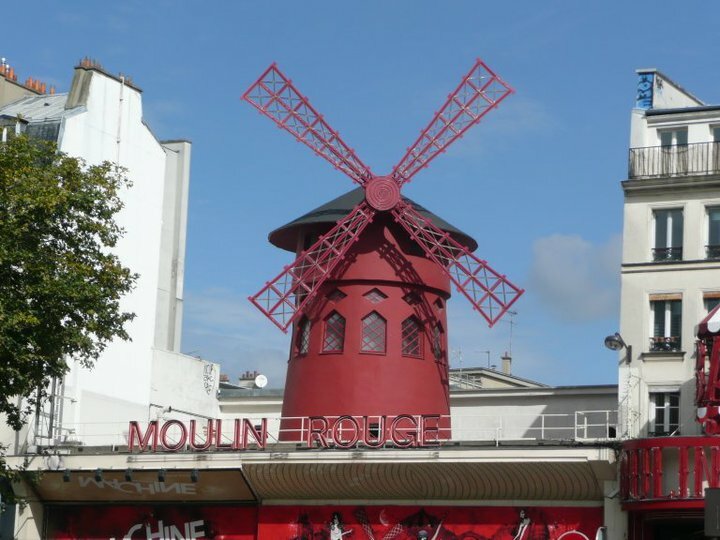 (More about Montmartre in “M”) The café is on Rue Lepic and takes its name from two nearby windmills: The Moulin Rouge and Moulin de la Galette. A is also for accordion. As we walked towards the cast iron footbridge, the Passerelle Léopold-Sédar-Senghor, which links the Musée d’Orsay and the Jardin des Tuileries (Tuileries Gardens) across the Seine, the strains of the accordion filled the air. 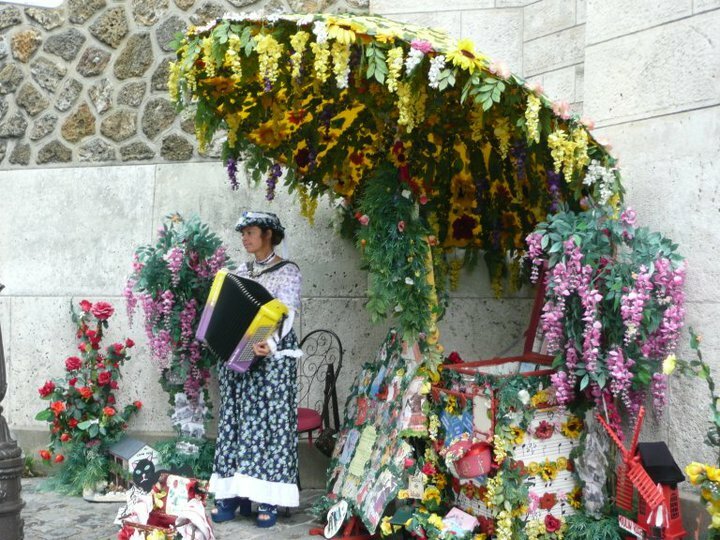 An accordionist was positioned on the bridge playing traditional French songs with his dog resting at his feet. A fitting sound, not only evoking, for me, all that is French and the essence of the French way of life but also romantic. As we crossed the bridge we noticed hundreds of padlocks attached to the ironwork. On closer inspection these were marked with initials and further research led me to understand that these are customary (across the world, not just in Paris) to symbolise love. How very appropriate for this, the “city of love”. The accordion was brought to France by Italian immigrants in the 1800s and the first accordion shop was opened up in Paris in 1890. The musette waltz (played on the accordion) became popular in France in the 1930s and the accordion also became associated with French café music. And, last but not least, A is for apéritif (or as we affectionately call it, apéro), my favourite French custom, a pre dinner drink often served with snacks. The traditional apéritif in France is Pastis, an aniseed-flavoured alcohol that is served clear, with un carafe d’eau (carafe of water) and turns cloudy when water is added. Within hours of arriving in France we very quickly learned to appreciate the twilight (apprécier le crépuscule ) over a glass of our chosen apéritif of rosé wine (du vin rosé). After a long, albeit satisfying, day of walking around Paris, looking at the many delights the city had to offer, there was nothing more relaxing than sitting outside our chosen café with a glass and recounting the adventures of our day and planning the adventures of the next.